American short-story writer, poet, editor, and critic Edgar Allan Poe is famous for his tales of mystery and horror. In addition, he initiated the modern detective story. In order to make an emphasis on certain items Poe used various stylistic devices. Great attention is drawn to repetition. According to Maclin (1996) “repetition is using of the same word, structure or idea more than once for emphasis or for a special effect” (p.293). In addition, Vandres (1937) states: “Repetition is one of the figures that has its origin in the emotive language” (p. 147). In the analysis of Poe’s famous narrative poem “Annabel Lee”, we may find repetition of words “love”, “loved”, “child”, “darling” as though he wants to describe his love from his childhood. Some of them repeat within a single line as in “we loved with a love that was more than love” (Poe, 1992). Moreover, Poe couples repetition of consonant sounds with repetition of vowel sounds that develops aesthetic effect in his poetry, as in “many and many”, “love and be loved” (Poe, 1992). In addition, sounds “w” and “l” are combined: “but we loved with a love that was more than love” (Poe, 1992). 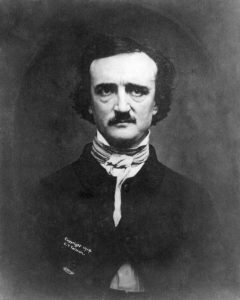 As well Poe repeats key phrases, for instance, “in a kingdom by the sea” and “my Annabel Lee” or “my beautiful Annabel Lee” to create combination of ideas (Poe, 1992). In “The Raven” Poe used repetition of sound “g” and “h” to underline sorrow, darkness, sadness, horror and doom as in “On this home by horror haunted” or in “What this grim, ungainly, ghastly, gaunt and ominous bird of yore”. In conclusion, we may observe Poe was the master of repetitions. With the help of this device he produced dark tones in the poetry and created complex atmosphere. MACLINE A. 1996. Reference Guide to English. Washington D.C., 1996. POE E. A. 1992. The Collected Tales and Poems. New York, 1992. Vandres, J. 1937. Language. Moskow. This poem analysis essay is written by our professional authors to provide you with a good example and give you inspiration. We remind you that any usage of the text that violates author’s rights is prohibited, but we know the struggle and we are always ready to help you. Place an order using the form below, specify your instructions and wait for our professionals to write a great poem analysis essay. Top quality and confidentiality are guaranteed! In case any questions may arise, you can always contact your author via online chat or ask for help our support team. We are waiting for you!